In his first contact with the Navy, the President of the Republic visited, today, the Lisbon Naval Base and the Quarters of the Marine Fusiliers, in Alfeite, where he was briefed on the activities of that branch of the Armed Forces. 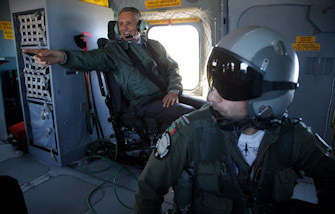 In the company of the Minister of Defence, Dr. Luís Amado, and by the Chief of the Naval General Staff, Admiral Fernando Melo Gomes, President Aníbal Cavaco Silva boarded the frigate “Côrte-Real”, where he was provided with a briefing and assisted, in the Operations Centre, to the conduct of a simulated operation of evacuation of civilians. Later, in a naval helicopter, the President flew over the Lisbon Naval Base and landed in the Quarters of the Marine Fusiliers, to visit an exhibition set up by that Corps to demonstrate its various operational activities. At the end of the visit, the detachment of marine fusiliers which had been receiving training for a mission in the Democratic Republic of the Congo was introduced to the President.